Fish Tales Thanksgiving/Easter/Year-Round : Kathie Hill Music, LLC, Making music with and for kids for over 25 years! Fish Tales are stories that are "supernatural, completely factual and actually occurred." Why? Because these Fish Tales come from God's Word! At the Fish Tales Fishing Tournament kids will join their host, Mr. Gill for a great time of "fishin' 'n listenin'" to Bible stories...about fish. In the Fish Tale, "Great Fish for Grateful Folks" kids will learn what the fish symbol identified early believers, then how Jesus fed five thousand people a supernatural supper of real fish and bread. A special emphasis of this tale is the thanksgiving that Jesus expressed to His heavenly Father and his encouragement for us to be thankful...even for fish sandwiches! In "Good Fish for Easter Day" kids find out what was so "good" about Good Friday and the relationship of the cross to the resurrection. And the story doesn't stop there, but continues to Easter evening when Jesus ate fish to prove he was alive. Children will really "get their hooks" into the story of the Resurrection with this exciting Fish Tale and be challenged to respond to the gospel themselves and come to Jesus. In the story of Jesus' call to the fishermen, "Many Fish for Fishers of Men" kids learn about the Great Commision and how God multiplies our efforts when we share the gospel. Perform one of the three Fish Tales for a 15-20 minute mini-musical, combine two for a 30-minute program or present all three for a full-length musical. So, why not grab a rod and a reel, meet us at the lake to catch the message in our Fish Tales? I love that there are pull-out songs for Sunday morning services. My 1st-3rd graders prepared two "tales" from the book as each section can stand alone. And I've done the full musical with 1st-6th graders as there is enough mature content and routines to keep the older students challenged. THIS IS ONE OF MY FAVORITES! My Kids Choir loved performing Fish Tales. Because the stories can be performed in short time periods, we incorporated them into our regular Sunday Worship services. So many parents attended that normally don't attend church. 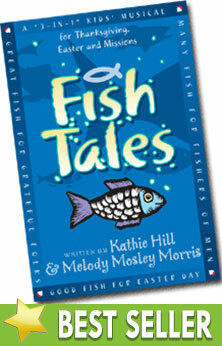 These Fish Tales were a great ministry tool! Our pastor pushed for this one and I am glad he did! We live in the Pacific Northwest where fishing is plentiful! We easily transferred our performance from indoors to an outdoor stage for our city's National Day of Prayer. Without Kathie sharing the amazing gifts that God has given her we might be up a creek! PRINT ON DEMAND. Allow 4-5 weeks for delivery - 50 BOOK MINIMUM ORDER via PRIORITY MAIL only. Downloadable PDF of all songs in lead line & script, with permission to make 3 copies . Additional copies require purchase of additional 3x license/s. Downloadable orchestrations for 2 songs for brass.